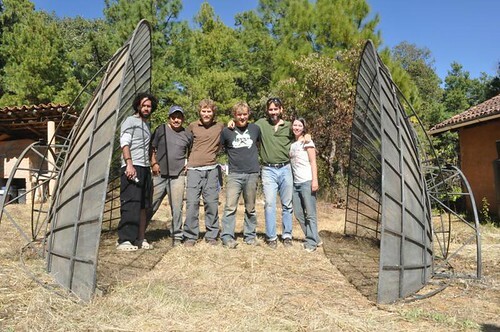 A Giant Solar Oven in our Future! 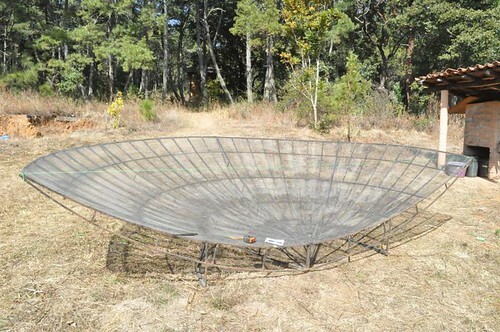 For years, we have been on the look-out for an old satellite dish, hoping to find one to create a solar oven. The dish can be covered in foil or reflective material, pointed at the sun, and its focal point will have lots of reflected heat waiting to cook pizza, bread, casseroles - even fry an egg! 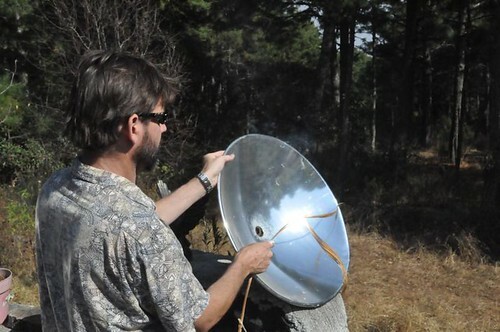 This article details how to make a solar oven from an old satellite dish. Below, Brian is demonstrating how even a small reflective disc is very powerful and can light sticks on fire if focused on the sun. A few days ago Todd from Pátzcuaro contacted us - his friend, David, an avocado farmer in very rural Michoacán, was interested in unloading an old dish. Jumping on the opportunity, Brian drove to go meet David and Todd, load up the HUGE dish into a truck, and haul it back to the Bosque Village. David was so kind to provide both a truck and driver to get the satellite dish from his ranch to the Bosque. The dish measures 15 feet across (4.5 meters). We are considering turning it into two semi-giant solar ovens rather than connecting the halves into one mega-giant oven. Perhaps one will be used as a solar oven, and the other as a solar skillet. 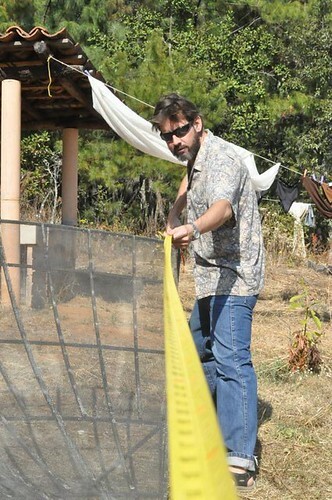 The new solar oven will be an addition to our current solar oven and lorena stoves. Thanks so much to David for your generosity, and for Todd for connecting us with David! You are currently browsing the News and thoughts from the Bosque Village weblog archives for January, 2011. Entries (RSS) and Comments (RSS). 20 queries. 0.373 seconds.